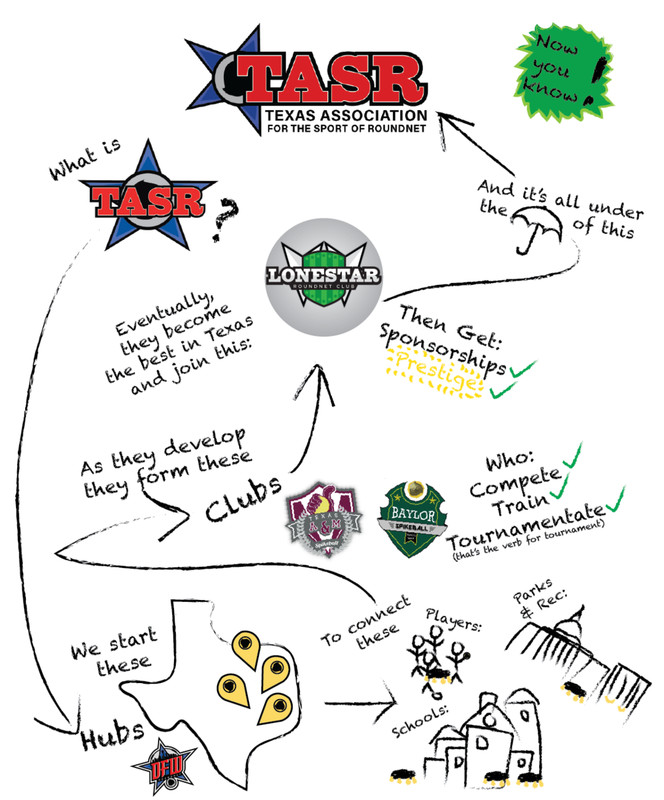 What is the Texas Association for the Sport of Roundnet (TASR)? The Texas Association for the Sport of Roundnet (TASR) was founded by Logan Cornelius and Brian Childs in 2018 as a means to grow the sport of roundnet in the state of Texas. We serve the roundnet community by connecting players across the state, equipping leaders to grow the sport in their area, and providing a structured network for club and player development! We are the first organization of our kind and hope to start a wave of similar organizations across the country. Create a framework for the sport of roundnet in Texas that maintains a broader vision of connecting the state. We grow local players through hubs, develop better players through clubs, and establish players at the national level through Lonestar Roundnet Club. There are many players that play in our state, but most do not have connections or relationships with any other players. The Texas roundnet community is operating as a bunch of islands with no central leadership - that's where TASR steps in. TASR's social media influence will help market new hubs and expose existing hubs to the wider network of players in their area. TASR provides a proven system for building hubs in new areas while also providing more structure around groups that already exist. TASR will not only help build hubs and form clubs but it will also help sustain them through leadership transitions. TASR will be a local adviser to empower PE educators and parks & rec professionals to grow the sport in their area. TASR acts as a personal adviser to help our hub leaders in answering roundnet questions of all kinds. TASR's hub and club model provides resources and avenues for committed players to take their game to the next level. TASR will help your group connect with the local community through events of all kinds, whether through helping host tournaments, establish leagues, teach clinics, or even develop consistent pick up sessions. Seriously, just go out there and play!! By joining your local hub! This is a great way to join the roundnet community and meet some great people! Some areas do not have an organized group of players... but that does not mean there are no roundnet players near you. A hub is the perfect way to connect you with players in your city and we would love to help you find them!